Braving the heat this year with thousands of dedicated PMC cyclists, Senators John Kerry and Scott Brown put their political differences aside to once again kick off the Pan-Massachusetts Challenge ride at the Sturbridge starting line. Both senators are riding to help raise money for cancer research and treatment at Dana-Farber Cancer Institute through the Jimmy Fund. Senator John Kerry, PMC Founder and Exectuive Director, BIlly Starr, and Senator Scott Brown get ready to kick off the 33rd PMC at the Sturbridge starting line. 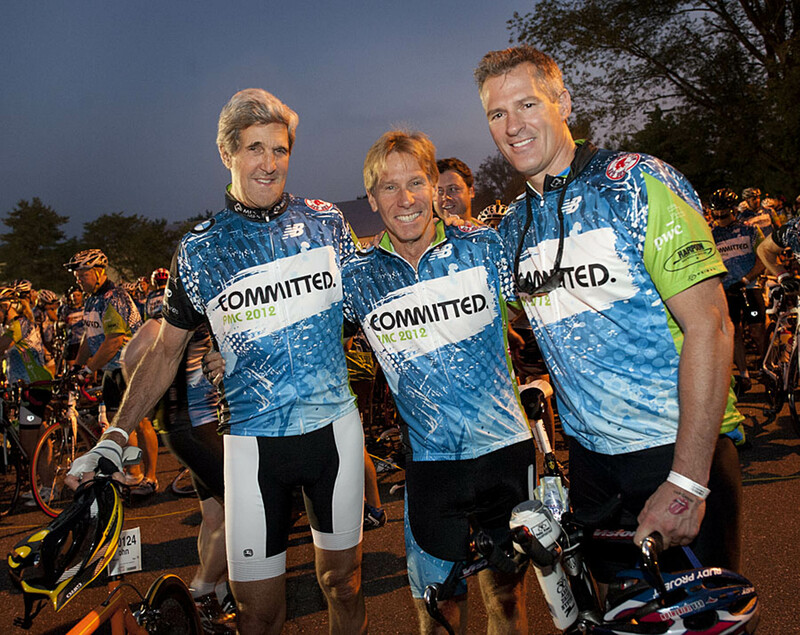 Senator Kerry is a 10-time PMC cyclists who is also a survivor of prostate cancer and whose wife, Teresa Heinz, has battled breast cancer. Senator Brown is returning for his third year. Also joining the senators on the ride this year is Chief of Staff, US Army (retired) General George W. Casey. At the other starting line in Wellesley were Red Sox wives, Holly Beckett, Tiffany Ortiz, and Kathryn Nixon, who came back from North Carolina to rejoin her former Team 9 pals and ride alongside Sox GM Bobby Valentine. For the first time, Stacey Lucchino, wife of Sox CEO Larry Lucchino, captain of Team 9, and 10-year PMCer, participated as a virtual rider (raising money from London, where she is watching the Olympics). Red Sox wives and Team 9 members, Holly Beckett, Tiffany Ortiz, and Kathryn NIxon gather for one last photo before leading thousands of PMC cyclists at the Wellesley starting line. Although the weather was your typical hot August day, the dedication and commitment the cyclists have for the PMC, helped them cross the finish line in Bourne, for the first day of the two day ride. For riders continuing to the Wellesley or Provincetown finish line, best of luck and stay hydrated. Great work for all PMCers and volunteers!